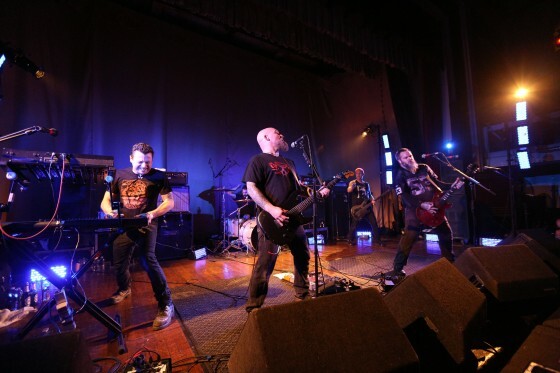 NEUROSIS' sprawling European tour in support of their tenth LP Honor Found In Decay draws near, set to bring on the most intense touring schedule the band has embarked on in years, beginning in less than two weeks at the annual Hellfest in Clisson, France. While this year’s massive festival includes gargantuan headlining acts Kiss, ZZ Top, Danzig, Down, Morbid Angel, Twisted Sister and hundreds more, NEUROSIS will headline “The Valley” stage, with support from Sleep, High On Fire, Black Cobra, Pallbearer, Black Breath, Eagle Twin and others. In addition to the European tour, NEUROSIS has confirmed a new stateside performance following their U.S. live actions in support of Honor Found In Decay late last year and in the beginning of 2013. The new show has been booked on August 24th in Providence, Rhode Island with support from Lustmord, the concert just one element of the city-wide NecronomiCon -- a four-day convention exploring the works of H.P. Lovecraft and other past and present writers as an exploration of the intersection of science and art that lays at the foundation of the “Cthulhu Mythos” genre. Since 1985 this matchless force has surpassed the boundaries of any genre, never ceasing to mutate and progress their songwriting and sonic delivery, and never failing to mesmerize audiences both in the studio and onstage.